When you’re trying to choose a dentist in Canton, one of the best things you can do is get the perspective of past and present patients. After all, dentists are businesspeople, and of course they’re going to claim that they offer the services and compassion that you need and deserve. But the truth always comes out in consumer reviews. We’re proud to say that our patients consistently give us 5 stars. Why is everyone so eager to praise us? “Everyone was super friendly and helpful such as the receptionist, hygienist and dentist. 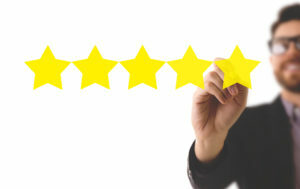 They really cared about my comfort and health.” — Lisa M.
Do You Want a 5-Star Experience? If you are tired of dreading your dental visits, please give us a try. We offer a wide range of dental services, from basic prevention to advanced treatments that are designed to help your oral health recover from even serious problems. We also offer cosmetic services, Invisalign, TMJ headache prevention, and sedation dentistry. If you have questions about our office, Dr. Robison, our staff, our policies, or anything else related to what we do, please don’t hesitate to contact us at 734-453-6320.